Each vehicle in our Green Fleet is stocked with equipment to restore your water damaged home. Water loss incidents in Nashua can cause a home to have a damper environment or standing water in some areas. It is easier to see puddles on your floor, but damp air can also cause problems and make breathing inside air uncomfortable. Overdrying can also cause problems, so we use unique instruments that keep our machinery from doing so during water removal projects in Nashua. These pieces of equipment do not become as crucial during the use of pumps and extraction wands as they do when we turn on our desiccation machinery. Desiccation pulls moisture out of the air. The removal of water vapor forces moisture trapped behind less-permeable coverings, such as vinyl wall coverings and gloss paints, into the atmosphere and then into our machines. As this occurs, taking readings to prevent the over-drying of your house's interior components becomes very important. Everything in the typical home includes some moisture content. While things may seem dry under normal circumstances, even the driest wood still contains some small percentage of moisture. Dropping below this through induced environmental changes in your home can cause permanent damage. SERVPRO technicians know the desired amounts of everyday materials and can easily prevent such damage from happening. Moisture readers tell us the amount of moisture inside anything we test. The items we check with our readers include wood floors, trim, and furniture. Without our testing machinery, these items could end up too dry and split, crack, peel, or become damaged in other ways. We want to return your home to its preloss state, "Like it never even happened." Allowing the things inside your residence to end up too dry keeps us from achieving our goal of helping you and your family. Call SERVPRO of Nashua for all of your home's restoration and mitigation needs, particularly when water removal services can help. Our 24-hour services number, (603) 889-2311, is always answered to serve you better. Read more about Nashua here. Are You Prepared for Extreme Weather Property Damage in Nashua? SERVPRO of Nashua is ready to restore your water damaged home. Give us a call! Nothing changes more than the weather, and the aftermath of extreme weather in Nashua is a change most homeowners do not relish. Heavy precipitation, high winds, and stormy conditions can wreak severe damage to residential property, sometimes causing enough harm to force families to temporary lodgings. Minimizing the disruption to your happy family life is our goal as we work to mitigate the damage done by violent and punishing storms. Flood, storm, and wind damage in Nashua can devastate your life as well as your home. The force of straight line and tumultuous power of tornadic winds can rip roofs off their supports and send trees and utility poles crashing into the exterior and windows of your house. Once breaching the external integrity of your house, heavy snow, ice, and rain make their way into the interior. From top to bottom, the structural components of your dwelling absorb copious quantities of moisture, starting a cycle of damage and deterioration. When SERVPRO arrives, a seasoned project manager evaluates the situation. Our crews tarp and board up areas open to the elements to prevent further water incursion and protect the spaces while technicians begin implementation of the tasks listed on the manager’s work plan. If possible, we create areas within your dwelling where you and your family can live during the work. Contents damaged by the storm’s effects might be packed out, tracked by our Content Claim Inventory System (CCIS), and cleaned and dried by technicians at our productions facility. SERVPRO contains the damaged areas with physical barriers and sometimes negative pressure air scrubbing systems to prevent the migration of water and drift of residues. We use powerful pumps and extractors to remove standing water and industrial strength air movers, heaters, and dehumidifiers to reduce moisture to normal levels. The SERVPRO remediation crew spends the time and effort necessary to return the interior of your home to preloss condition. SERVPRO of Nashua is the right call when fierce storms visit severe harm to your home. Call us day or night at (603) 889-2311, and a highly-qualified team of experts soon will be on the way. When your church is facing water damage, time is extremely critical. Contact our IICRC certified team for water damage remediation right away. Water loss incidents have the potential to cause substantial structural damage to your Nashua church. The only way to actively avoid this potential outcome is to seek out the fast response of restoration professionals like ours. With effective mitigation strategies like extraction and efficient drying, structural concerns that lead to reconstruction can often get avoided. Our professionals are available 24/7 to respond to water loss emergencies, ensuring that no customer has to wait a moment longer than necessary for money and time-saving mitigation solutions. 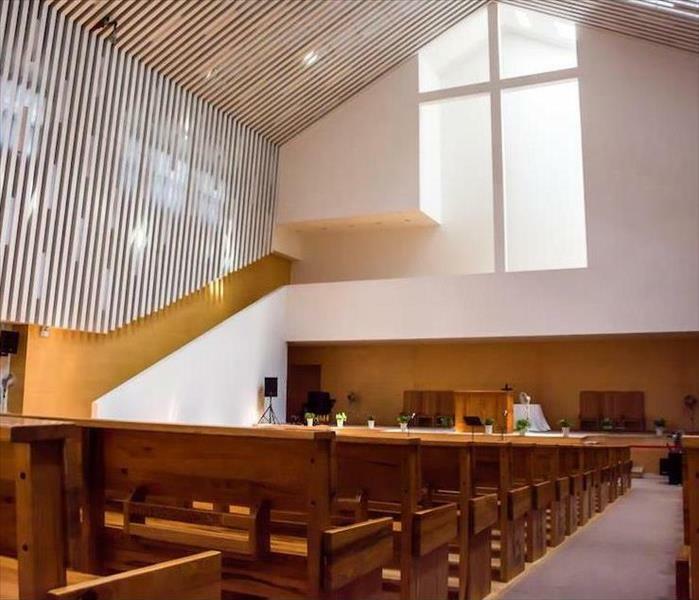 Extraction is one of the first steps for any water damage situation in your Nashua church, but water removal requires fast response and assessment of this damage. 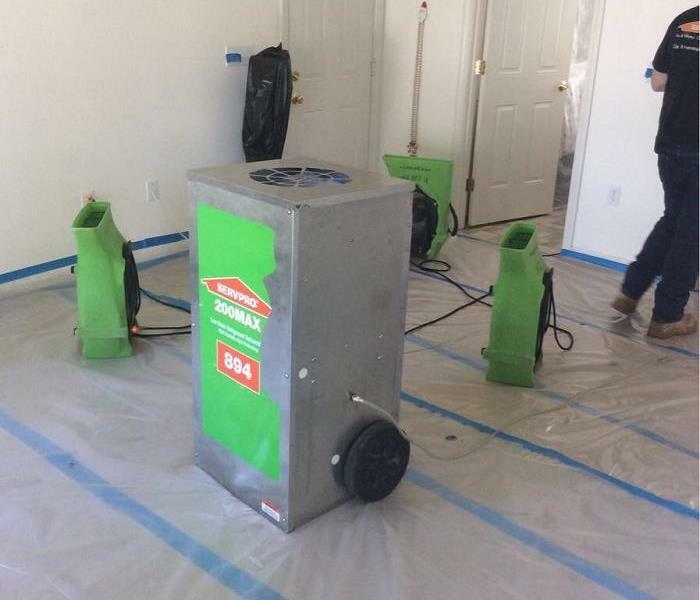 Our SERVPRO professionals have a rapid response to all emergencies, arriving with the full measure of our industry-leading equipment designed to protect structural elements from damaging saturation and prolonged moisture exposure, which ultimately requires tear out and reconstruction. Every portion of your church represents an investment, the costliest of these often being the sanctuary area. From plush carpeting to the rows of pews, water loss incidents threaten the composition of these materials almost immediately. 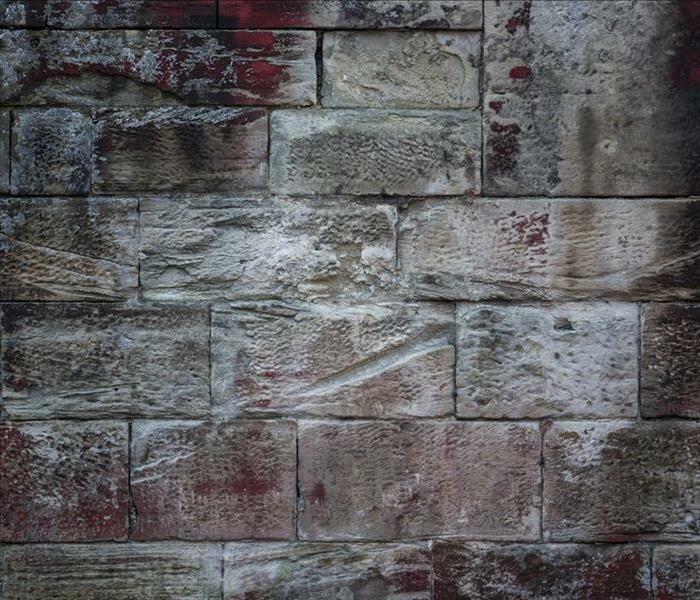 The longer that these elements remain exposed, the more they can warp and distort until they are no longer salvageable. Our SERVPRO team can work to remove standing water and oversaturation quickly with effective tools like our wet-vacs with wands or our weighted extractors. With the high volume of electronics and sound equipment throughout the average modern church these days, standing water and damp conditions can threaten these elements as well. Our effective mitigation team can move at-risk electronics to a safe area of the church while extraction, drying, and any replacement or reconstruction gets underway. While substantial water loss incidents can potentially be very costly and challenging to restore, the right response from our SERVPRO of Nashua team to the emergency can reduce out-of-pocket expenses and the time to restore the damage. Give our experienced professionals a call today at (603) 889-2311. Click here for information about the city of Nashua. Is Water Causing Damage to Your Nashua Basement? SERVPRO has the equipment to quickly remove water from your basement. The basement of your Nashua home could be the location for storage, laundry, or extra living space. While you have many options with this lowest level of your home, it is also the most susceptible to situations like flooding. With something as simple as a broken window in the small area above the ground where your foundation gets exposed to the elements, you can allow water to flow into your home unabated. While you might not know how to stop the situation once it has started, our professionals can help to clean up the mess and restore the damage fast. Many phases make up flood removal and damage restoration for your Nashua home, even if these effects only occur in your basement. 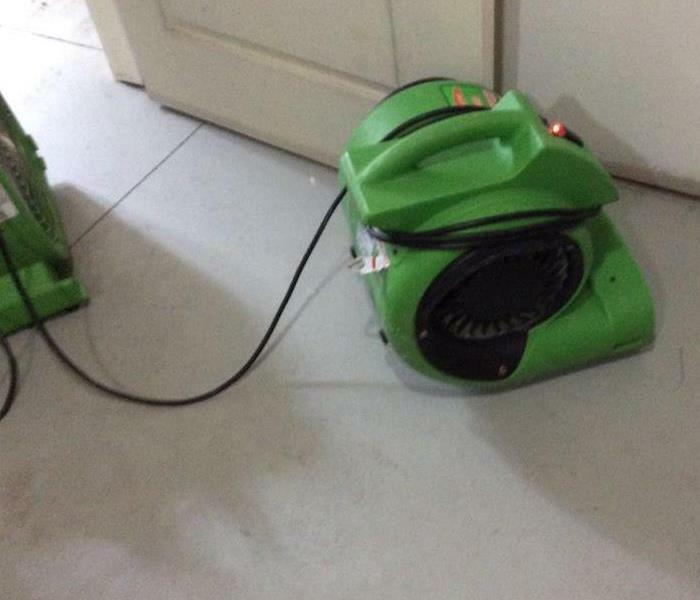 Our SERVPRO team has effective and advanced equipment designed to extract floodwater and dry up the area quickly. We can set up these machines as soon as we arrive, and with a 24-hour response to emergencies like flooding, our team can arrive quickly to get mitigation started to prevent further loss. When our team first arrives at your home, and we begin our initial assessment of the water damage, some of our professionals get tasked with moving at-risk items to a safe area. If it gets determined that the damage is likely to remain in the basement area, many of these items can get safely stored in an unaffected portion of your property. Our team can then safely get set up to begin vital extraction work. We have several tools and machines that can help through the extraction process, both to reach inaccessible places and to quickly pull high volumes of floodwater from the affected areas. Our equipment ranges from handheld wet-vacs with extraction wands for more challenging extraction points to truck-mounted pumps that can quickly remove the water. The goal is to remove the excess as promptly as possible to get to essential drying efforts. While there are numerous steps to recovering your basement after a flood, removing the pooling water and mitigating loss is an essential first step. 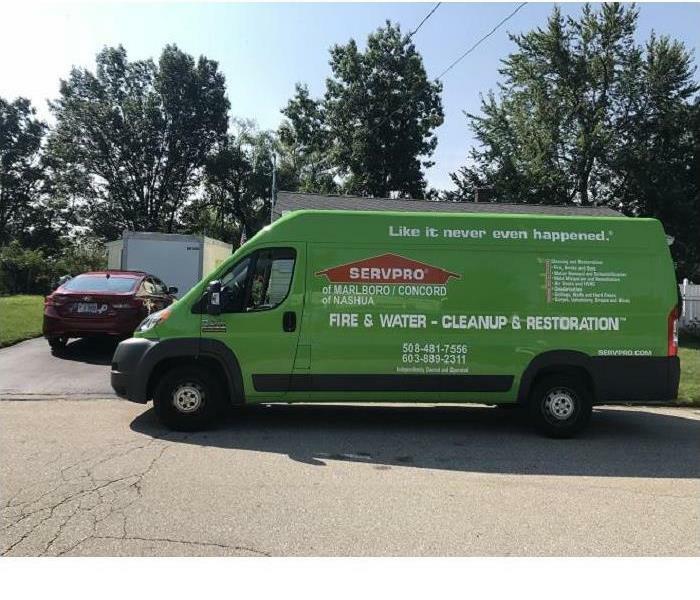 Our SERVPRO of Nashua rapid response team is available 24/7 for all facets of flood recovery by calling (603) 889-2311. Nashua was once the mid-way stopping point for stage coaches going between Boston and Amherst. Read more here. Are Fire Damage Odors Lingering in Your Nashua Home? Don't let the smoke odor linger in your fire damaged home. Call SERVPRO of Nashua to remove the odor. Many disasters can impact indoor air quality in your Nashua home. While many homeowners might think of these concerns as particulates and contaminants in the air that can cause health effects or hazards, this is not exclusively the case. After situations like fires, there are smoke and soot particulates in the environment, but there are also harsh odors often left behind from wet smoke situations where fire smolders at a lower heat. These concerns can also make it difficult for families to live comfortably in a home, even with the rest of the property restored. Addressing fire odor in your Nashua home is often one of the final steps for professional restoration and recovery, as many of the worst elements that worsen these conditions get removed and replaced through demolition and reconstruction. Our SERVPRO professionals can work quickly to identify what areas of your property cannot sustain restoration efforts and require removal and later replacement, and quickly remove these from the area along with other hazardous debris. When the time has come for odor removal and deodorization, our SERVPRO team has multiple machines that can work to eliminate lingering scents from materials and open areas of your house. Hydroxyl generators, which have likely been in use since the demolition portion of our restoration work, also work to reduce noxious odors throughout your home actively. For more concentrated effects, we can utilize ozone generators and thermal foggers to eliminate these harsh smells permanently. For the contents of your home that can also fall victim to the wet smoke scent and residue, our contents department can remove these items from the house and take them to our nearby facility for cleaning and deodorizing. They get safely stored in our facility until your home gets fully restored and prepared for their return. Fire odors can be a challenging effect to overcome without the expertise and equipment of our professionals. You can count on the rapid response and advanced equipment of our SERVPRO of Nashua fire restoration specialists. Give us a call today at (603) 889-2311. When Foul Odors Linger After A Fire In Your Nashua Office Building, Call The Professionals At SERVPRO! SERVPRO of Nashua is thorough when cleaning your office building in Nashua or the surround areas after a fire has occurred. A fire in your Nashua office building can be devastating, even if the fire was small. It can lead to the temporary shutdown of your business, besides costly repairs and restoration. Of course, preventing a fire from happening in the first place is the best thing, but if one does occur, you need to move fast to get help, so the settled smoke and soot do not do additional damage. 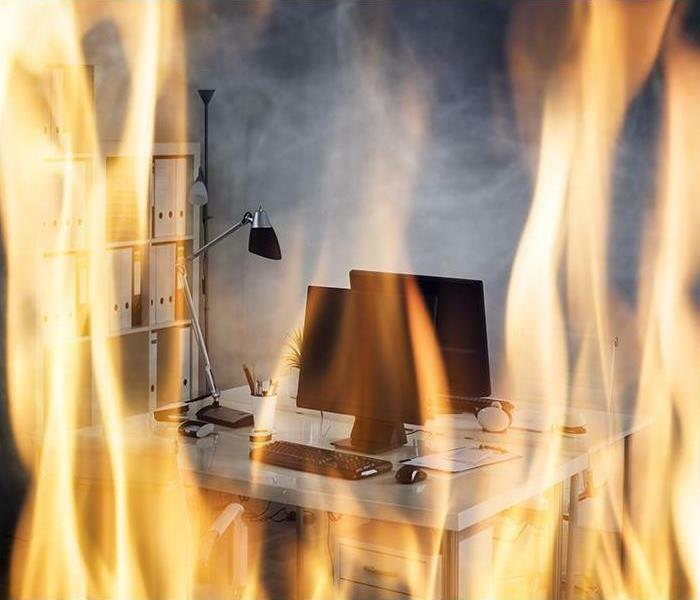 Commercial fire odors in your Nashua business are also an issue after a fire, which is even more reason to hire a professional remediation specialist, like SERVPRO. Our staff is trained and equipped to handle all damages from fire including the damage from the flames themselves, water damage, from firefighting efforts, and smoke odors, which can travel through areas that weren’t even affected by the fire. One of the most critical parts of fire restoration is smoke odor elimination. It is essential that we act immediately, so get in touch with us as soon as the fire is out. Smoke can cling to upholstered furniture and carpeting if they are not adequately deodorized. SERVPRO techs’ deodorization procedures break up the smoke molecules to eliminate the lingering smell. Smoke can also enter and remain in between the walls. Smoke odor can reoccur if we do not correctly remove it in these areas. Depending on the amount of smoke damage, the ceilings and walls might need to be cleaned and repainted. Smoke and odor particles are also airborne after the fire, and we use multiple treatments during the restoration process with specialty equipment to clean the air. Air scrubbers which are equipped with HEPA filtration systems help to remove the odor particles from the air, which enhances the efficiency of cleaning the air to make it safe again for you and your employees. Microthermal fogging uses a strong deodorizer so we can neutralize odor which permeates the air that was affected by smoke. SERVPRO of Nashua is thorough when cleaning your office building in Nashua or the surround areas after a fire has occurred. We understand the importance of getting your building wholly restored to its previous condition, so call us right away at (603) 889-2311 once the fire is out. Click here for more about Nashua. With both threats from groundwater springs and severe weather throughout the year, it can prove challenging to keep your Nashua basement dry. While you might have already attempted to implement precautionary measures to reduce moisture as best as you can, for many homeowners it is a battle that they cannot hope to win without the professional expertise and experience of trained water restoration professionals. Our team can help you to not only dry up the damage you currently experience but also to work to find a solution that keeps this area of your home drier moving forward. For many homeowners, a wet basement in their Nashua home is something that they must grow accustomed to having, as fighting this process is nickel and diming their bank accounts to an extreme degree. Instead of working on your own to try and fight the effects of moisture penetration in your basement, you can count on our SERVPRO technicians to offer real-time solutions that can both dry up the damage your home has already sustained from these penetration points, and work to reduce or eliminate dampness in the future. We offer efficient extraction solutions that can remove any excess water quickly. Our SERVPRO crew can expedite the drying process from here. Throughout the initial inspection period, and once the excess water has gotten removed from the basement, we can determine the penetration points that allowed water and moisture into this lower level of your home. For vulnerabilities in your blockwork, we can apply hydraulic cement to offer pressure resistance to penetrating groundwater. If you discover efflorescence on your basement walls, time to call SERVPRO. Recovering your home is only part of the process, however. We also have to determine the best way to keep your basement dry in the years to come, and this could offer a range of possibilities. We can, under extreme conditions, regrade the basement floor toward drains to allow water better flow to these points in the floor. 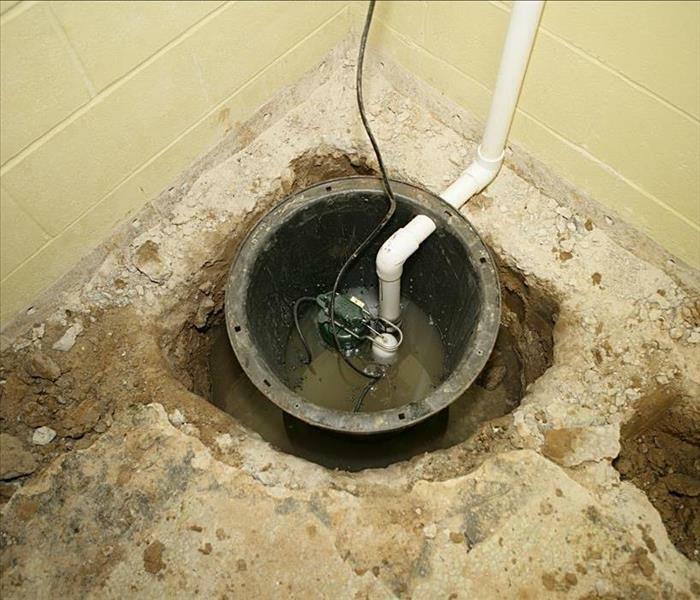 We can install sump pumps, dehumidifiers, and other equipment as well to reduce moisture and water damage. The added benefit of fewer chances of mold growth since the moisture levels have been reduced is an added feature and advantage to maintaining a standard RH in your basement. Our SERVPRO of Nashua team is a wise choice for your wet basement issues because we know how to make it “Like it never even happened.” Give us a call today at (603) 889-2311. Click here to learn more about our local community. Mold is resilient and can grow anywhere it has access to two things: moisture and food. Moisture can come from the direct introduction of water to high humidity conditions created from poor ventilation and organic materials ranging from wood to dust can be used as food. Our mold remediation services are two-fold for both determining the cause as well as the thorough elimination of both spores and mold. This attic in Nashua had multiple issues leading to a perfect environment for mold growth. While there was no leaking in the attic, it did have inadequate insulation and a poorly connected bathroom exhaust fan. The ineffective evacuation of air led to moist air entering the attic regularly whenever the homeowners used the shower. The expelled, humid air became trapped, resulting in a perfect home for dormant mold spores to activate. In an area of the home where moisture build-up was already an issue, SERVPRO technicians chose to use soda blasting as a way to clean the mold from surfaces. This effective method uses sodium bicarbonate (also known as baking soda) which is mildly abrasive, delivered under pressure to both clean and deodorize during the same application. This method helps rid the tell-tale odor that comes with mold. 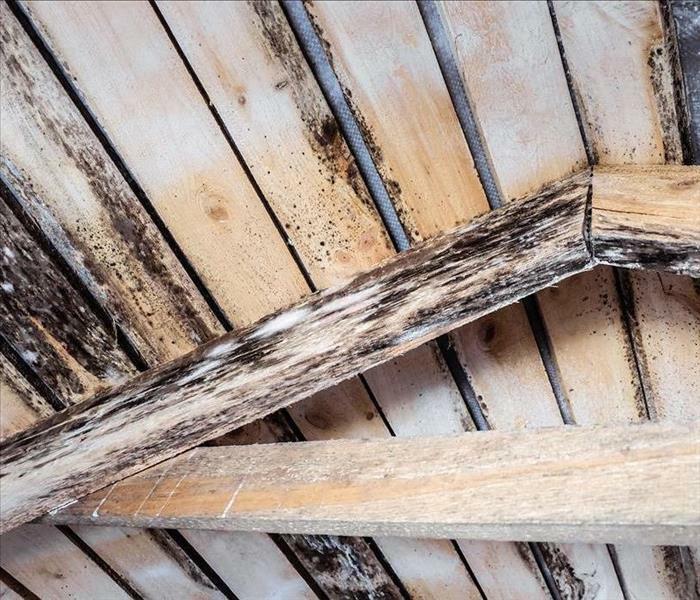 Once the mold colonies were removed from the surfaces in the attic, we treated the wood and exposed areas with a specially formulated antifungal product to ensure the attic surfaces were not favorable for the return of mold. Some items stored in the attic also had signs of mold colony invasion. We were able to hand clean those items with an antifungal cleaner to destroy the fungi on numerous possessions. Once the items were dry, the homeowner was advised to store items in airtight plastic containers to ensure the cleaned contents remained mold-free and weren't allowed to collect dust, setting up the problem again. Mold remediation should begin as soon as you notice any signs of mold in your home. Our technicians are IICRC certified and available 24/7 to assist you. Contact SERVPRO of Nashua at (603) 889-2311 to get started immediately. More about this NH city by clicking here. Will Frozen Pipes Cause Water Damage in Your Nashua Home This Winter? Winterize your home to prevent frozen pipes. Every year, winters in Nashua can bring about severe, cold weather. When the temperature drops, flood damage and frozen pipes can cause you problems and force you to call in a professional restoration company such as SERVPRO. 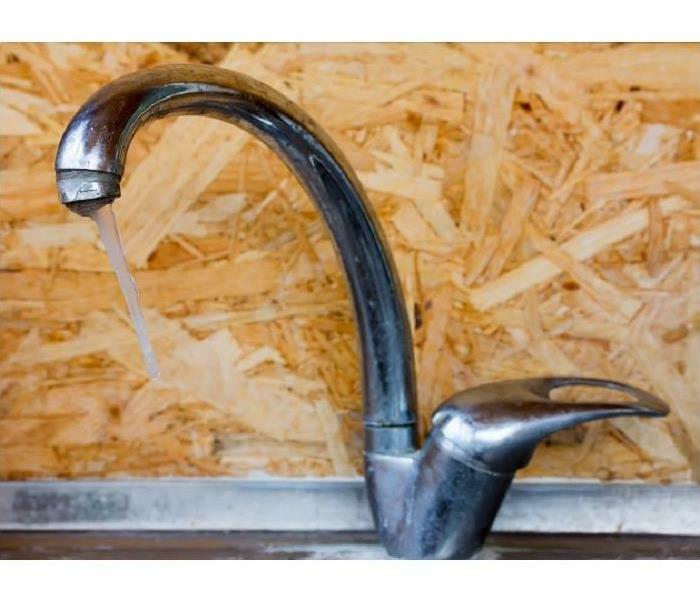 When water freezes, it expands and can cause your pipes to crack. Once there is a hole inside your plumbing system, gallons of water can pour into your living area quickly. Should you leave moisture for too long, you may be dealing with mold inside your Nashua home. Once water starts to leak the issues can get much worse as time goes by. Mitigating problems with flood damage or a frozen pipe in Nashua is our SERVPRO team's specialty. When we first arrive at your house, we figure out exactly where your plumbing system failed. Once we find the crack in the pipe, we often shut off your water; then we call in a certified plumber to fix the crack where the pipes froze. After the original problem gets repaired and there is not any more moisture entering the home, we can begin the restoration process. Before we begin mitigating issues inside your building, we inspect the affected area and make sure there are no potential safety hazards for our workers or your family. Once any issues like falling drywall or slick floors get mitigated, we then figure out which of your building materials and contents got wet. If items get saturated like your carpet or pad, we start with removing the ruined objects. After removing destroyed items, we extract water from porous materials such as carpets and fabrics. After we have removed all of the water we could while it is in its liquid form, we set up air movers and dehumidifiers to speed up the natural evaporation process. We keep the equipment set up until our moisture sensors indicate that levels are back to preloss conditions. If a pipe inside your home ever freezes and breaks, call in the professionals at SERVPRO of Nashua at (603) 889-2311 any time of the day. Click here to read about Nashua’s history. 4/9/2019 - Are You Prepared for Extreme Weather Property Damage in Nashua? 3/21/2019 - Is Water Causing Damage to Your Nashua Basement? 3/11/2019 - Are Fire Damage Odors Lingering in Your Nashua Home? 2/25/2019 - When Foul Odors Linger After A Fire In Your Nashua Office Building, Call The Professionals At SERVPRO! 1/16/2019 - Will Frozen Pipes Cause Water Damage in Your Nashua Home This Winter?